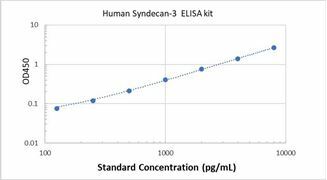 Specificity This assay has high sensitivity and excellent specificity for detection of Human Syndecan-3. No significant cross-reactivity or interference between Human Syndecan-3 and analogues was observed. 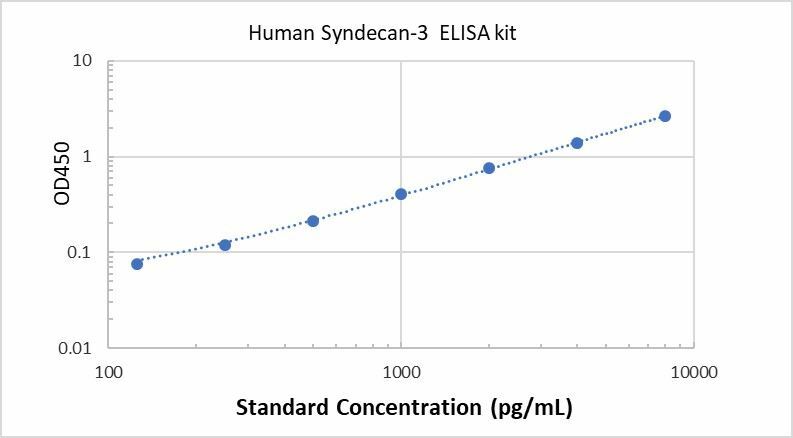 Typical Data ELISA: Human Syndecan-3 ELISA Kit (Colorimetric). These standard curves are provided for demonstration only. A standard curve should be generated for each set of samples assayed. Background Syndecans are single transmembrane domain proteins that are thought to act as coreceptors, especially for G protein-coupled receptors. These core proteins carry three to five heparan sulfate and chondroitin sulfate chains, which allow for interaction with a large variety of ligands including fibroblast growth factors, vascular endothelial growth factor, transforming growth factor-beta, fibronectin and antithrombin-1. Interactions between fibronectin and some syndecans can be modulated by the extracellular matrix protein tenascin C.